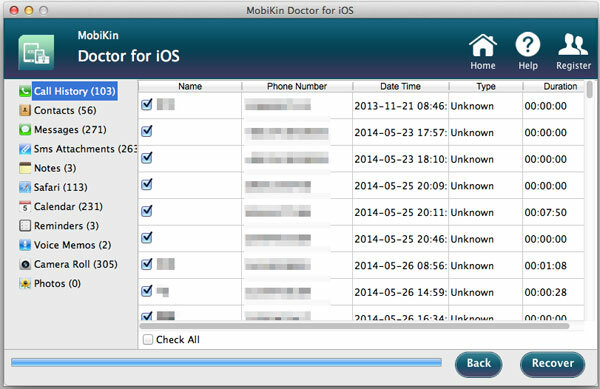 MobiKin Doctor for iOS (Mac Version) is an all-in-one third-party program to recover iPhone, iPad or iPod touch call history, text messages, contacts, photos and more from iTunes backups easily. Please be noted that this tool only supports users to recover iOS data from iTunes backups. Data losing on iPhone, iPad or iPod touch have become a big trouble that haunt all iOS users. So MobiKin Doctor for iOS (Mac version) is here to provide the best restoring ability to help you find back all your lost, deleted or formatted iOS data from iTunes backup files. You may lose data in various circumstances and the reasons why you lost them also different. So MobiKin as the most professional data recovery program for iPhone, iPad and iPod, it works well as the life saver in your daily life and work, because it can retrieve all your lost data from your device's daily backups due to any reasons. Deleting some vital files on your iPhone, iPad or iPod touch by pressing wrong button or using some unfamiliar functions. All data disappear after jailbreak or update. Device is crashed, smashed, broken, water damaged, lost or stolen, virus attack, system crash or more reasons. Return your device to factory settings without backup. Preview any types of files in the main interface with one simple click. Text contents (including SMS attachment) can be viewed with Name, size, phone number, data time, duration, etc. Camera Roll and Photos can be viewed in the program in the Thumbnail list mode. You can go through the detailed pictures and mark all files you need to restore. No one wants to install a tool that have a complex steps. So we have simplified the procedure of this software into 3 simple steps through hundreds of test that you can handle this program as easy as 1-2-3. All process can be finished in 3 steps: Scan > Preview > Recover. Batch and partial recovery are all supported. Compatible with all generations of iOS devices, such as the latest iPhone X, iPhone 8 Plus/8, iPhone 7 Plus, iPhone 7/6S/6, iPhone 6 Plus, iPhone SE, iPhone 5S/5C, iPad Air, the new iPad, iPod touch, etc. 100% secure without any data loss and device damage. Users of MobiKin Doctor for iOS (Mac Version) Have Surpassed 740,000+ Worldwide. I really needed to find a contact that I had not stored and which got lost as I upgraded my phone! but this product worked wonders!!!! I got all my message history back as well as the contact number! thanks!!! If your iDevice is not at hand, but you need to get access to the iTunes backup files to extract some files selectively, you can ask help from this program; Or if your data on the device is damaged due to virus attack, factory formatting, mistakenly operation, etc., you can also use the tool to extract the whole contents from the previous backup files to your device. Now, just follow the below steps to retrieve your deleted, lost or formatted contacts, text messages, call history, etc. on Mac OS X easily. To begin with, please be sure that you've downloaded and installed this iOS Data Recovery program on your Mac computer. Select the one of your device according to the device name, backup data or serial number, and then hit "Start Scan" button to start scanning all data on the backup files. Find the data you want to extract or restore, and then mark them one by one. Finally hit "Recover" button to save the exported files on your Mac computer very well. iPhone X, iPhone 8 Plus, iPhone 8, iPhone 7 Plus, iPhone 7, iPhone 6s, iPhone 6s Plus, iPhone 6, iPhone 6 Plus, iPhone 5s, iPhone 5c, iPhone 5, etc. - If I have purchased your software, can I upgrade it for free in the future? If so, how? You can click Help > Check for updates to see whether your version is the latest, if not, for software upgrade, you have to redownload the latest version from our product page. Then install the latest version to your computer again. Note: Registration information you purchased for the old version is valid for the upgrade version.